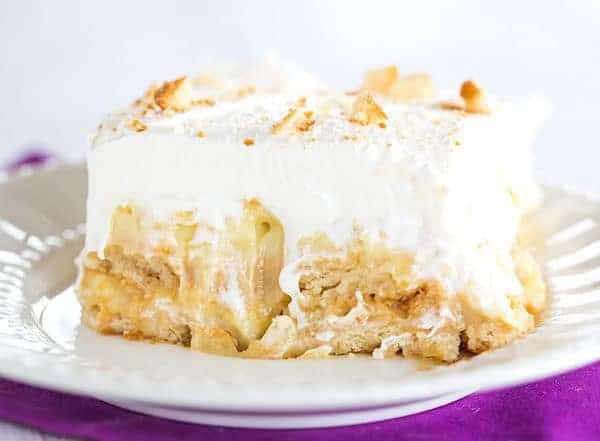 This easy pineapple icebox cake is made with layers of Nilla wafers, vanilla pudding, crushed pineapple, a Cool Whip topping. A big crowd pleaser! 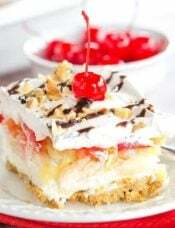 My grandma was the queen of icebox cakes – they were a regular appearance at her Sunday dinners, especially during the spring and summertime. 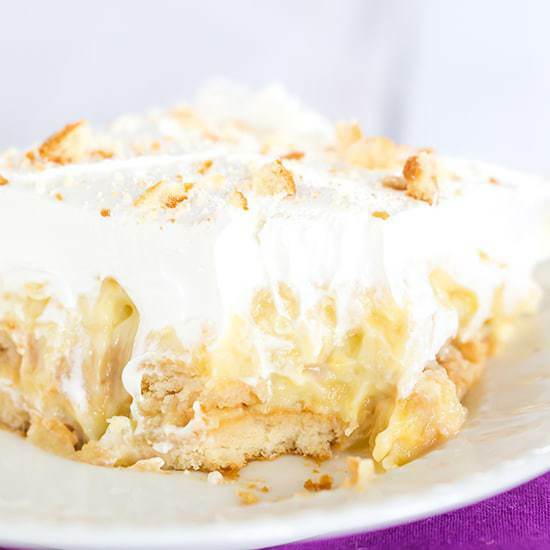 Hers were always a very basic icebox cake recipe – layers of graham crackers alternating with layers of vanilla pudding. I put a springtime, Easter spin to that recipe for dessert this past Sunday. 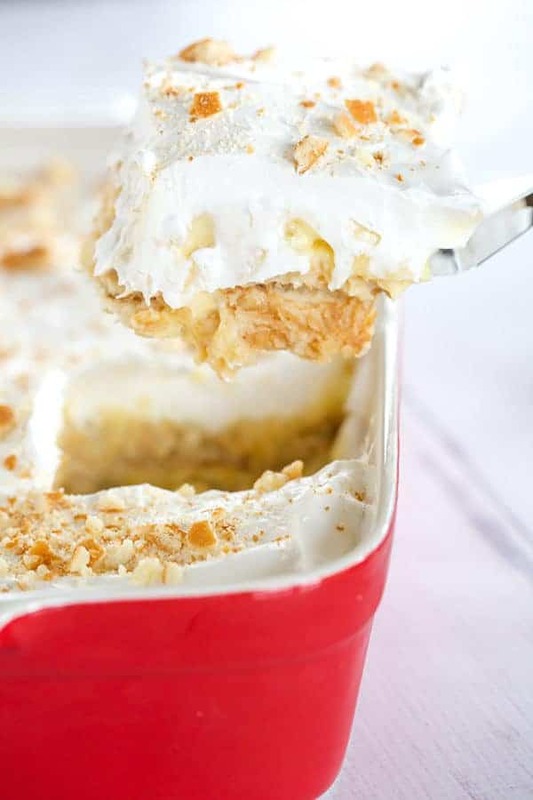 I used Nilla wafers instead of graham crackers, stirred crushed pineapple into the vanilla pudding, and topped the whole thing with Cool Whip and crushed Nilla wafers. The pineapple icebox cake was a huge hit on Sunday, so much so that both my mom and mother-in-law suggested that I make it again for Easter Sunday to add to the dessert spread. It’s so quick and easy, I immediately said yes! If you have 20 minutes, you can throw this together, pop it in the fridge, and… done! I was meeting a friend for lunch on Saturday and I had precisely 30 minutes after I had finished getting ready before I had to leave, and I managed to make this AND clean up the kitchen before I left. I love quick and easy desserts that end up being family favorites – great to keep in your back pocket when you need to throw something together fast! 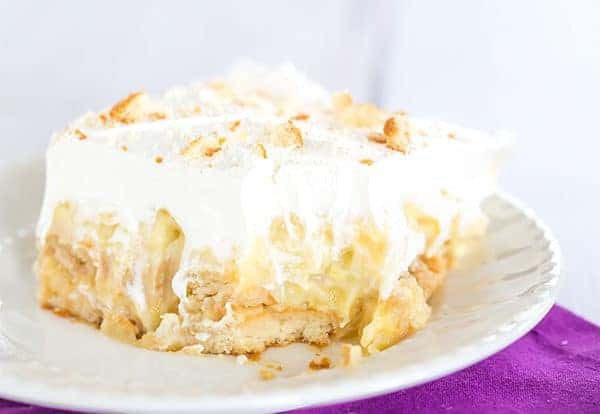 This pineapple icebox cake makes a perfect Easter dessert – it’s light and refreshing, and the pineapple will get you ready for warm, sunny days! 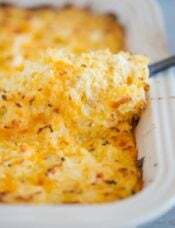 Line the bottom of a 9x13-inch baking dish with Nilla wafers, breaking them to fill in any big gaps along the edges. Whisk together 1 box of instant pudding with 2 cups of the milk for 5 minutes, or until the pudding thickens and appears set. Stir in 1 can of the crushed pineapple. Pour the pudding evenly over the layer of Nilla wafers, using a rubber spatula to spread into an even layer. Top with another layer of Nilla wafers, again breaking them into pieces if needed to fill any large gaps. 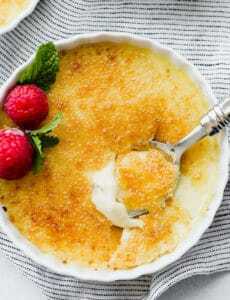 Prepare the second box of pudding as you did the first, with the remaining 2 cups of milk. Stir the second can of drained crushed pineapple into the pudding. Pour the pudding over the 2nd layer of Nilla wafers, spreading it into an even layer with a rubber spatula. Top with the Cool Whip, using a spatula to spread into an even layer. Refrigerate for at least 4 hours. 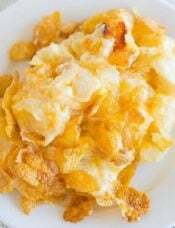 Prior to serving, garnish the top with additional crushed Nilla wafers. Recipe sounded delicious but it turned out kind of bland and boring. We wouldn’t make it again. Love your recipes, but suggest that you enable us to put them on Pinterest, so we can keep them all I one place. Hi Annette! There are Pinterest buttons in multiple locations here – you can hover over any photo to Pin it, or when you are scrolling there should be a bar at the bottom with buttons for Pinterest, Facebook, Yum, Twitter and Email. Simply click the Pinterest button to save to Pinterest! Hi Michelle! I made this dessert for Easter after seeing it last week and everyone loved it! It was super easy and perfect for spring- thanks for sharing! I made this recipe using Cheesecake flavored pudding (all the vanilla was sold out at my local store) and it was perfect. I made half the recipe for our small family. I’m glad I halved the recipe because it is all too easy to polish off! I also agree with Lynn re the Nabisco Vanilla Wafers. Unfortunately; their recipe seems to have changed and not for the better :( However, the store brand had far superior taste, and didn’t leave a hole in your wallet. It’s in the refrigerator as we speak. I was tempted to add shredded coconut, but maybe next time. Hmmm. I have Trader Joes Triple Ginger Snaps, a whole fresh pineapple, a pint of heavy cream, and two boxes of cook-n-serve vanilla pudding mix. I think I can make a variation of this happen. The TJ ginger snaps are not as porous as Nilla wafers, but I think if I give it overnight set time instead of 4 hours, it will work. OMG! I wish I had a piece right now. I am trying to diet!!! But, I will make this for Easter. I just bought a yummy Coconut Cake from Sams Club today. They were sampling it and OMG so yummy. I only had one tiny bite. I cannot wait to cut into this one on Easter. 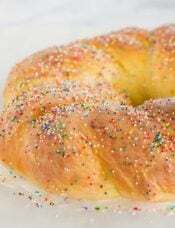 My mother makes something similar called Summer Cool Cake. Its yellow cake topped with Vanilla pudding, crushed pineapple, and cool whip. It was one of my favorites growing up. Love the flavor combo and its super easy! I was wondering the same as Martha. This sounds super easy and tasty! 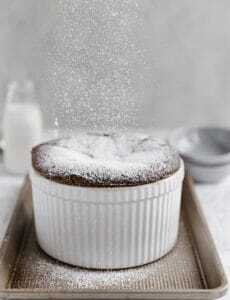 Is there a reason why you can’t prepare the pudding all at once? Hi Martha, You could, and then just divide it when assembling the cake. This recipe sounds yummy. May I suggest that you try Trader Joe’s Vanilla Wafers in your next recipe that you would otherwise use Nilla Wafers? Nabisco doesn’t even use REAL vanilla in their Nilla wafers any more! The TJs ones are SOOOO yummy! 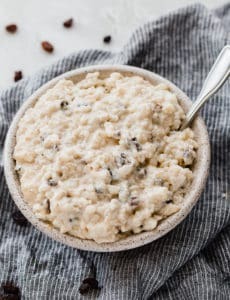 Packed with flavor and loaded with real vanilla and lots of vanilla bean flecks! My mouth is watering that sounds so good!! I can’t wait to make it and share it with my family. 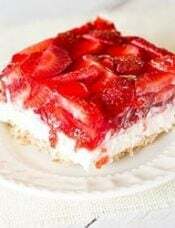 I remember having this dessert years and years ago — my sweet sister-in-law made it and she has since passed away. I never got the recipe and now I have it. Thank you, every time I’ll make it I’ll think of her. Buona Pasqua! OMG — I almost forgot to say “HAPPY EASTER” to you and your family, Michelle, and to everyone else out there!!! 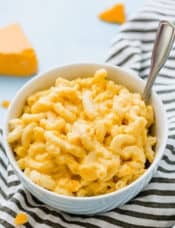 Wow, Michelle, this recipe looks right up my alley — easy & delicious! And, most of all, it literally screams “SPRING.” Thanks so much for passing it along to us.